The Hurdle: Get S’more Campers and S’more Leads! Since 1963, this family owned campground has been developing their campsite to meet the growing tourist demand. The Great Divide needed a creative brand, strong digital presence and the right sales tools to bring them to the top of consumers’ minds. When they approached our team at KickCharge® Creative, their branding was simple and did not convey the message they were trying to get across to their consumers—a fun, family-friendly getaway, just a stone’s throw from the city! Our KickCharge Creative creative team knew exactly which direction to head in when The Great Divide Campground team contacted us. After designing a logo that exudes everything one thinks about when the word ‘camping’ comes to mind, we were confident that The Great Divide would see success for years ahead. Their new website design is one that gives consumers an outdoor-feel, the moment they visit the home page. For a team that is passionate about protecting the intrinsic beauty of nature, and committed to preserving that beauty for the enjoyment of all of their guests, we were excited to present their new branding, digital presence and sales tools to them and their campers. 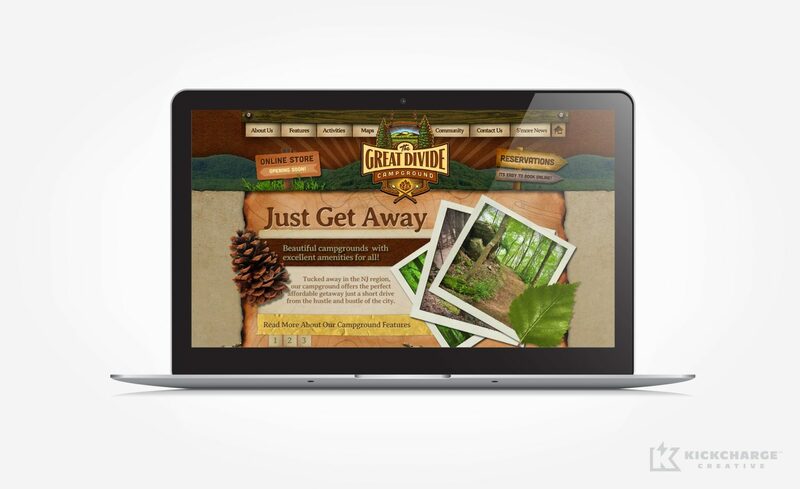 Within just one year of rebranding and redesigning their website with KickCharge Creative, The Great Divide Campground saw a 9% increase in leads and a 10% increase in sales close rates. Since their rebranding, The Great Divide has also expanded their activity choices for their campers; offering a variety of extra outdoor amenities for all ages. More leads, sales close rates and fun campground features? — That’s what we call success!